There will be carpeting and chef service involved. 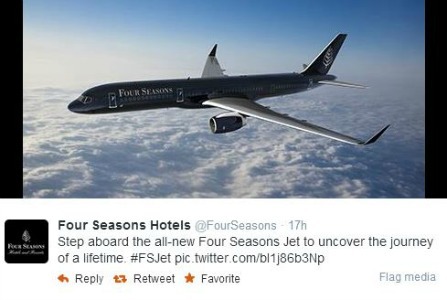 The Four Seasons is taking its branding experience aloft, launching its own airplanes to go along with the $119,000 round-the-world tours the company offers. The plane offers flatbed seats, carpeting and fancy toilets. Ooh la la. Wifi, chef service, spa treatments and tee times will also be available. The plane holds 233 passengers and will take off from Los Angeles starting in February 2015, heading to Bora Bora, Thailand, India, Turkey and London, making stops at Four Seasons hotels on the ground along the way. There will be accommodations for skis as well. Because, of course. In April, the trip will go across six cities including Milan and Prague, taking tours of 16 museums and theaters. This will cost about half of the winter trip ($69,000). And in August, the 24-day trip will visit cities including Seattle, Tokyo, the Maldives and the Serengeti (a region rather than a city, but you get it), with a stay at the company’s first safari lodge included. The price for that jumps back up to $119K. BTW, if you’re traveling alone, that $119,000 price tag grows to $130K. Or you can have the whole plane chartered for $110,000. Per day. Bloomberg says that the wealthy do love to spend their money on travel, but they’ve been pulling back because of concerns about the economy. Not to take the shine off this luxury holiday, but The Four Seasons isn’t the first to come up with this idea. USA Today rains on that parade with a reminder that Indian company Oberoi Hotels and Resorts has been doing it for years, but for charters of six passengers. So next year, while you’re getting elbowed by the middle seat, listening to Paul Blart: Mall Cop out of headphones that only work in one ear and navigating a dry $10 turkey sandwich in coach, you may just see a Four Seasons plane glide through the clouds out yonder.